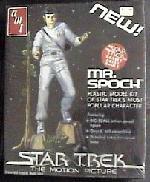 Item #AMT624 Amt- Re-issue Classic Star Trek Mr. Spock in Tin Litho Box Limited Edition Model Kit $44.95 ea. In Stock (HAS BEEN DISCONTINUED BY AMT) This first time ever officially, re-issue Classic Star Trek Amt Mr. Spock with Serpant model kit in Tin Litho box, molded in white, 8" long by 7" tall, 35 pieces, is a limited edition of only 1701 made, also includes instruction sheet, all plastic assembly, all kits are in near mint tin boxes & sealed, paint & glue Not included. Item #AMT622 Amt-Glow in the Dark Interplanetary U.F.O. Mystery Ship Re-Issue Model Kit $24.95 ea. In Stock (HAS BEEN DISCONTINUED BY AMT/R2) This New Amt re-issue Glow in the Dark Interplanetary UFO model kits are near mint in sealed box, in 1/500th. scale, over 20 pieces, about 13" long when assembled, skill level 2, molded in glow in the dark plastic, includes scout ship, includes decal set featuring alien & fleet markings & opening docking bay doors, paint & glue Not included, first time officially re-released in over 30 yrs. Item #820 Polar Lights Star Trek U.S.S. Enterprise 1701 Refit Snap-Together Model Kit Coming Soon $29.95 ea. This new Star Trek U.S.S. Enterprise A snap-together model kit is in 1:1,000th. scale, highly detailed, as seen in the classic Star Trek movies, skill level 2, Aztec decals, display stand & instruction sheet included, paint & glue Not needed or included, all boxes will be near mint and sealed, to pre-order call 1-260-255-9619 during regular business hrs. From Polar Lights this snap-together Classic Klingon D7 Battlecruiser model kit is in 1:1,000 scale,has over 35 pcs,includes decal & sticker sheets to create up to 4 different ships,choose your alliance, Klingon or Romulan,when assembled is almost 11" long,skill level 2,still sealed,paint & glue NOT included. Item #AMT1036 Star Trek- U.S.S. 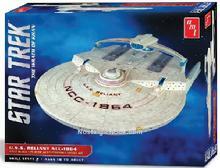 Reliant NCC-1864 Ship Model Kit $48.95 ea. In Stock This new U.S.S. Reliant Star Ship model kit is in 1:537th. scale, when assembled kit is 18" long by 11" wide, skill level 2, all boxes are near mint & sealed, new tooling, thicker saucer section, new ship markings decal sheet with registry numbers, domed metal rod display base, this ship is best known for being in Star Trek II The Wrath of Khan, paint & glue Not included. This 1979 out of production AMT/Matchbox is an Original remake of the Mr. Spock model from the 60`s, only minus the serpants as seen in the classic version, has Mr.Spock holding a communicator in his Motion Picture Uniform, still sealed, near mint box, paint & glue NOT included. Out of production, Amt/Ertl 1994, as seen on Star Trek Deep Space Nine Security officer Odo with phaser this vinyl model kit is still sealed, boxes are not mint but in good condition, when assembled the kit stands 12" tall, highly detailed, display base included, paint & glue Not included.